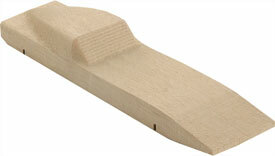 How to add weights to our Stingray Pinewood Derby car. It's as easy as ABC! Your race probably limits your car's weight to 5 oz. You will have a speed advantage if you can get as close to the limit as possible. The Stingray block will need about 2.8 oz of additional weight to bring it up to 5 oz. Below are two suggestions for adding weights to the stingray pinewood derby car. Use a combination of cylinders and a flat weight for optimum results. Using a 3/8" drill bit, drill two holes side by side into the bottom of the car behind the rear axle. Drill just deep enough to hold one 1/4 oz weight each. The end of each weight should be 1/8" recessed into the bottom of the block to give room for the wood putty. Drill additional hole pairs in front of the rear axle as needed to hold all the weights (including the Fine Tune Cylinder) as shown in the above diagram. 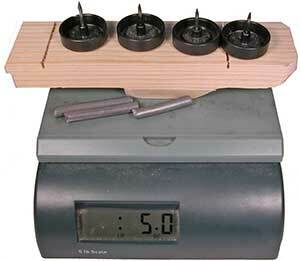 Weigh the block, wheels, axles and weights again . Adjust the amount of weight if needed by using part of the Fine Tune Weight in one of the existing holes or drill a new hole..
Insert all the weights in the holes and fill the weight holes with the wood putty. You may need to tap the cylinders into the holes with a small hammer. Allow to dry in a warm place for 12 hours.